Orlando, FL – HostDime.com, Inc., a global leader in data center infrastructure, will break ground on a new $25 million dollar, 88,000 square foot data center facility on a five acre parcel in Orlando, Florida in Q2 of 2016. The building will rise 110 feet high and be visible from Interstate 4, one of Central Florida’s main roadways that connects Orlando to Tampa on the West, and to Daytona Beach on the East. The land purchase contract will close before the end of 2015. Orlando-based Baker Barrios Architects, Inc. have designed the state-of-the-art facility in a contemporary style. The seven-story facility includes space for all of HostDime’s 130 U.S.-based employees and three floors of world-class data center space. In addition, the space will focus on HostDime’s client base. Clients can take advantage of on-site executive suites for overnight visits, including full bathrooms, showers, and full-sized beds, which HostDime believes to be an industry first. Clients also have access to private client cage space, private mini data center room, on-demand client offices, and a mix of amenities that includes ultra-fast 10G internet access. The ability to stay within the data center will allow clients to save the time and expense of finding lodging in town, as well as immediate access to their equipment during their stay. The facility will also feature a 36-foot-high warehouse storage area that clients can use at no charge for temporary storage of their equipment. 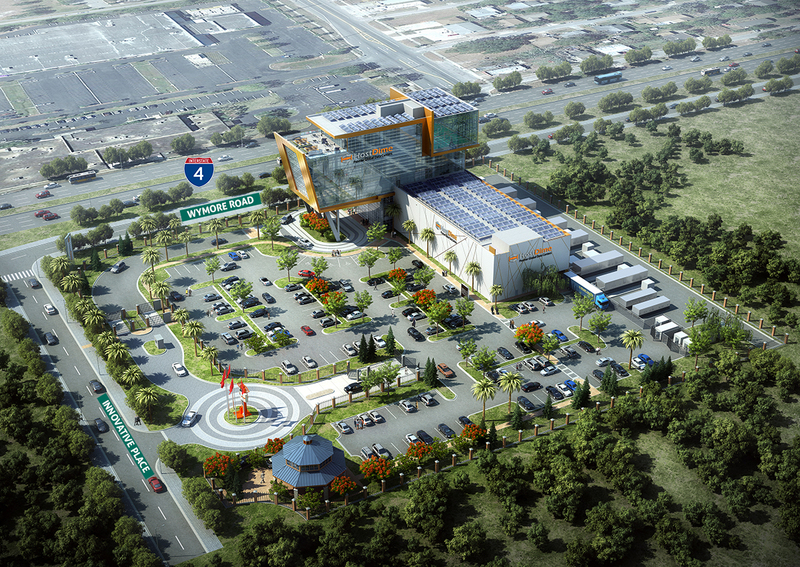 Guests will be greeted by a three-story-high atrium at the front of the building with a grand roundabout entrance. This atrium will also house an impressive mosaic video display spanning 36 feet tall and 10 feet wide, which is going to be one of the largest mosaic video walls in the world. The top floor will feature a large conference room and training center with a hybrid indoor/outdoor floor plan with approximately 3,500 square feet of outside terrace. It is designed to host national and global tech conferences for up to 200 people. Staff amenities include a game room, break room, cafeteria, quiet room, small fitness gym, and the entrance to the 2-story sports court. HostDime’s current flagship data center is located in Florida, USA and is nearing capacity. Their vision with the new facility is to expand its existing products and offerings to service its global client base and house government data. This modern age data center facility is designed to be a major peering/connection HUB for networks in the Southeastern United States and for South American companies. The facility is being engineered to meet and exceed requirements for some of the most widely known certifications such as HIPPA, PCI, SOC 2, and FISMA. The network is being designed to support over 100 gigabits of network connectivity. There will also be various dark fiber connectivity options between this new facility and all the major facilities in Miami, so HostDime’s new facility will be a great business continuity and disaster recovery site for many South Florida businesses. HostDime’s current network is globally recognized as one of the fastest networks in the United States that routes to all of South America, and this new facility will adopt this same performance. The new category 5 hurricane-rated facility will feature space for over 35,000 servers, a dozen or more Tier 1 bandwidth providers connecting in 3 full-sized meet me rooms, full Tier 4 level redundancy, and in-line hardware-based Distributed Denial of Service (DDoS) Attack Protection. The meet me rooms will be home to major telecom and fiber providers such as Level 3/TW Telecom, Summit Broadband, Cogent Communications, Zayo, Tower Cloud, FPL FiberNet, Sprint, T-Mobile, Brighthouse Networks, CenturyLink, and Verizon. 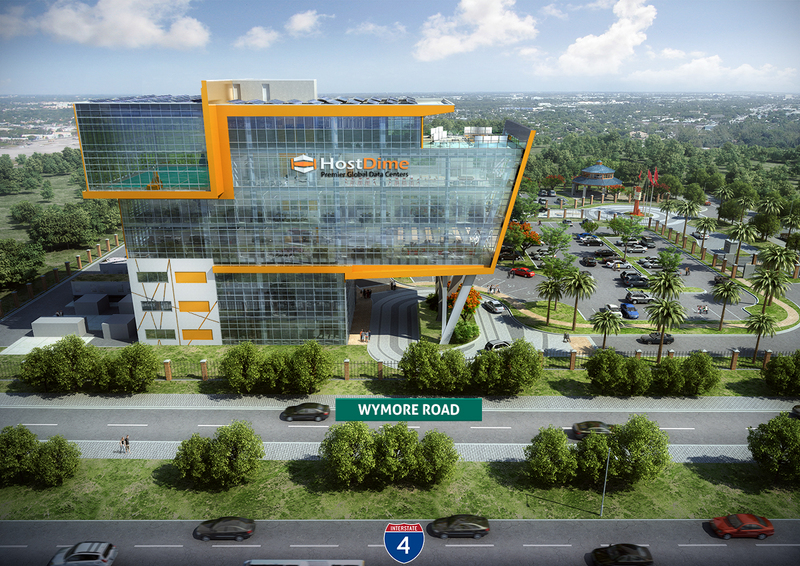 HostDime’s new facility will be one of the most well-connected data centers in Florida and the most connected facility in Orlando Metro area. As the Internet continues to evolve and penetrate globally, the need for networks to interconnect will become more adopted. Companies like Netflix that demand high capacity bandwidth will want to connect to major hubs in areas like Central Florida. This facility will be the meeting point for such needs. A unique, three-tier electrical power design will allow the facility to sustain two consecutive system failures and still be operational, making the standard N+1 redundancy a thing of the past. At its peak, the facility will also have over 10 megawatts of electric power capacity from Duke Energy. Backup generators will contain enough reserve fuel to run one week at 80% load without any commercial power available. At full capacity, the facility is designed to support 8MW of fully redundant power. Rooftops will feature solar panels in keeping with HostDime’s green initiatives; up to 25% of the facility will be powered by the sun. In addition, HostDime will utilize the latest in security and protection for the facility itself, including facial recognition access control, over one hundred 360 degree security cameras throughout the building and site, man-trap doors, and car-trap access to enter and leave the facility. The full perimeter of the site will be gated with 24/7 security personnel who will monitor the facility. HostDime will be using camera-equipped drones for automated exterior monitoring of the facility campus perimeter. Clients will be able to purchase an array of existing HostDime services such as scalable cloud servers, colocation services, fully managed or unmanaged bare-metal dedicated servers, virtual private servers, and private and public cloud environments. The ability to buy fully managed products by default is what still makes HostDime a very unique player in the industry. Since inception, HostDime has always been a fully managed service provider. “Back in 2003 when HostDime was a ‘startup’, many people would ask us, ‘Why are you building a data center in Orlando?,’ and I would reply ‘Why not?’. Fast forward to today and Central Florida is seen as a major technology epicenter in the Southeastern United States. This facility will be a major peering connection for companies to connect in a fast growing Central Florida region. The caliber and uniqueness of this facility can only be found in major metro areas such as New York or Los Angeles. We are taking a unique approach with this facility to be a marriage of client hospitality and data center infrastructure services. You will be able to step into this facility and never think about having your services elsewhere again with all the client amenities we are offering.” – Manny Vivar, CEO and VP of Global Operations. The new HostDime facility will be less than half a mile from the current data center HostDime operates in Central Florida. HostDime’s focus for the new facility is to keep up with current growth and the desire to expand its client amenities. Once the facility is finished in the summer of 2017, all new HostDime clients will be placed in the new facility. The 88,000 square-foot structure will be fully owned, operated, and occupied by HostDime. The iconic contemporary building will be a beacon for growth in the Florida business community and for HostDime’s entire global client base for many years to come. HostDime’s current DimeNOC data center will be a fully operational site for years to come. Both existing and new facilities will be functioning concurrently for the foreseeable future. When the new facility is ready in the summer of 2017, current clients may elect to move there. HostDime will do everything in our power to ensure a smooth transition. This move is not mandatory, rather an option for clients in the first few years. There will be an abundance of dark fiber installed to connect both facilities to ensure both are “hot” from a network perspective. This ensures minimal downtime during a transition that is less then 0.7 miles away. Once the new facility is up and running, all new clients will be deployed there instead of DimeNOC. HostDime.com, Inc. is a global data center company offering an array of cloud products which include managed services for scalable cloud storage, dedicated servers, VPS (Virtual Private Servers), and colocation. HostDime.com owns and operates data centers in Orlando, Florida as well as Mexico and Brazil, with network facilities in Colombia, Hong Kong, India, the United Kingdom, and the Netherlands. HostDime.com, Inc. was founded in 2001 and incorporated in Orlando in 2003 with over 250 global employees in seven countries. Presently ranked as one of the most reliable enterprise data centers in Southeastern USA, its network powers over 5,000,000 applications online for its 50,000+ active global client base. ← Ouvert ou fermé ?